“This behavior clearly qualifies as domestic abuse,” writes Randy Whorton in his race report from the Black Warrior 50k this past weekend. He’s describing his wife Kris Whorton’s win, and the fact that he had a hard time keeping up. All kidding aside, they did a phenomenal job this weekend, and Rock/Creek congratulates their efforts. The couple finished 5th overall, and Kris beat her previous course record. 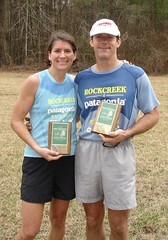 Kris and Randy are Rock/Creek race team members with a number of top finishes and course records on their resumes. Kris had sort of a rough run, but wow did she crank it up the last 10K. I really had a tough time keeping up. This behavior clearly qualifies as domestic abuse. She did win and lowered her course record by 6 minutes (4:45), and we finished 5th overall out of around 70 finishers. Fantastic conditions for us, really muddy with the temp hanging around 50. We encountered roughly 30 horses which mainly caused the mud fest. Black Warrior takes place in the Brushy Lake Recreational Area, a part of Alabama’s William B. Bankhead National Forest.